In the latest Transformers video game, you'll get to control Autobots and Decepticons battling it out as their home planet dies all around them. The new multiplayer modes coming to Fall of Cybertron are pretty intense. The first mode I sampled from Fall of Cybertron's multiplayer was a co-op objective-based mode where I played as a Scientist class character. Scientists are essentially engineers and are able to transform in jets, making them the only class that can fly. They can also drop sentry turrets in robot form and can tag enemies across the map for their partners to target. But they've also got the lowest health of any of the game's four multiplayer classes. There's a two-tiered with shield/life health system in FoC, which lets you regenerate from certain amounts of damage before getting dealt a fatal blow. • can also deploy a barrier force field that block enemy fire while still letting shoot allies out. I also played a bit of Escalation, the newest iteration of the Horde Mode-style co-op offering that first showed up in War for Cybertron. Escalation's a bit different than its predecessor. 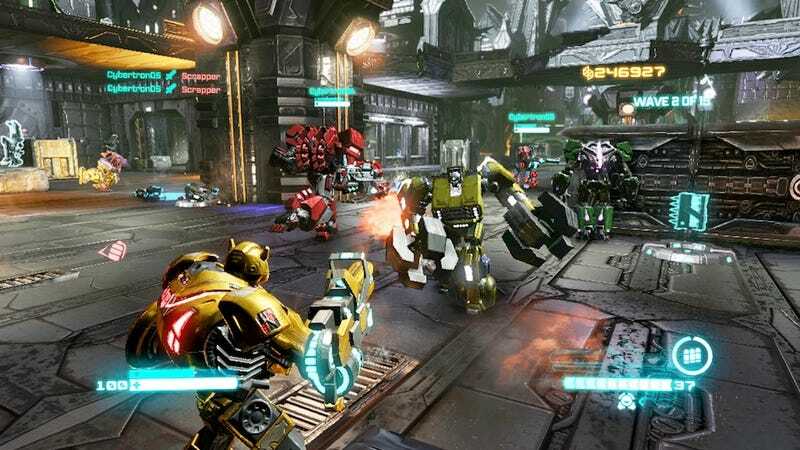 You need more teamwork to survive the continuous waves of enemies and different players can play the same type of Transformer but will wind up with different abilities depending on how they spend the points earned during battle. Each player can carry a heavy weapon and a primary weapon which can be brought at spawn points with in-game credits. There will also be armory areas that will be locked off where you'll need to spend credits to open up access. Once inside, better weapons can also be accessed. The cost to open such an area will be more than one player can earn in a wave, so a team will need to communicate to make sure everyone contributes to opening these spots up. There will also be weapons upgrade stations where you can tweak elements of a weapon so that it can carry more ammo, for example. These stations will also let you call in special attacks so if a team saves up enough credits, they can have an orbiting gunship target enemies with devastating airstrikes. Fall of Cybertron definitely feels like a step up from the experience delivered by dev studio High Moon in their last Transformers game. The upcoming title feels like it's offering players more of a chance to craft an individual style in the midst of heated online chaos. We'll get to see how it works out when Fall of Cybertron comes out in August.